3D Printer Buyer’s Guide – Ying Feng Precision Machinery Co., Ltd.
3D Printing is more than just prototyping. Today, 3D Printing off ers transformative advantages at every phase of creation, from initial concept design to production of fi nal products and all steps in between. Today’s competitive environment makes choosing the right 3D printers for every phase of creation more important than ever. Just a few years ago in-house 3D printing was enjoyed by only a few professional design engineers and was often limited to printing concept models and some prototypes. Once considered a novel luxury, 3D printing has proven to yield long-term strategic value by enhancing design-tomanufacturing capabilities and speeding time to market. Today, 3D printing technologies have allowed an ever growing number of creators to unleash and multiply the benefi ts of rapid in-house 3D printing across the entire creation process. Leading companies are now using 3D printing to evaluate more concepts in less time to improve decisions early in product development. As the design process moves forward, technical decisions are iteratively tested at every step to guide decisions, both big and small, to achieve improved performance, lower manufacturing costs, delivering higher quality and more successful product introductions. In pre-production, 3D printing is enabling faster fi rst article production to support marketing and sales functions, and early adopter customers. And in fi nal production processes, 3D printing is enabling higher productivity, economical customization, improved quality and greater effi ciency in a growing number of industries. 2 What is the right 3D printer technology for your application? Choosing the right 3D printer among the various alternatives may at fi rst seem like a daunting task. There are signifi cant diff erences in how each printing technology turns digital data into a solid object. Today’s 3D printers can use a variety of materials with vast diff erences in structural properties, feature defi nition, surface fi nish, environmental resistance, visual appearance, accuracy and precision, useful life, thermal properties and more. It is important to fi rst defi ne the primary applications where 3D printing will be used to guide the selection of the right technologies that will provide the greatest positive impact for your business. This article will highlight some of the common 3D printing applications, and outline some key attributes to consider when selecting a 3D printer. all stakeholders to make better choices. more eff ective decision making . are print speed, part cost and life-like print output. As product designs begin to take shape, designers need to verify design elements to ensure the new product will function as intended. In-house 3D printing allows design verifi cation to be an terative process where designers identify and address design challenges throughout the design process to spur new inventions or quickly identify the need for design revisions. investment in tooling, jigs and fi xtures necessary to manufacture the new product. At this stage the supply chain expands with purchase commitments for the raw material and other required components. Lead time for these required items can stretch out time to market, and 3D printing can, in a variety of ways, reduce the investment risk and shorten the time cycle for product launch. functional products for testing and early customer placements. are also of paramount importance to ensure fi nal product quality is achieved and manufacturing tooling will not require expensive and timeconsuming rework. to achieve new levels of product functionality. meet specifi c biocompatibility requirements. performance attributes to consider when comparing alternate 3D printers. Part cost is typically expressed in cost per volume such as cost per cubic inch or cost per cubic centimeter. Costs for individual parts can vary widely even on the same 3D printer depending on specifi c part geometry, so be sure to understand if the part cost provided by a vendor is for a specific part, or a “typical” part that is an average across a group of diff erent parts. It is often helpful to calculate part cost based on your own suite of STL files representing your typical parts to determine your expected part costs. In order to properly compare claims made by various vendors it is also important to understand what has, and has not, been included to arrive at the part cost estimate. diff erences in the material effi ciency of various 3D printers and understanding the true material consumption is another key factor in accurately comparing print costs. Part cost is driven by how much total material a 3D printer consumes to print a given set of parts and the price of the materials consumed. The lowest part costs are typically found with powder based 3D printing technologies. Inexpensive gypsum powder is the base model material that forms the bulk of the part. Unused powder is continually recycled in the printer and reused resulting in part costs that may be one-third to one-half the price of parts from other 3D printing technologies. being done, compromise in feature detail quality can reduce the accuracy of testing results. attributable to the print process and are generally highly accurate. Plastic 3D printing technologies typically use heat, UV light or both as energy sources to process the print materials adding additional variables that can impact accuracy. Other factors impacting 3D print accuracy include part size and geometry. Some 3D printers provide varying levels of print preparation tools for fine tuning accuracy for specifi c geometries. Accuracy claims by manufacturers are usually for specific measurement test parts and actual results will vary depending on part geometry, so it is important to defi ne your application accuracy requirements and test the 3D printer under consideration using your specifi c application geometry. 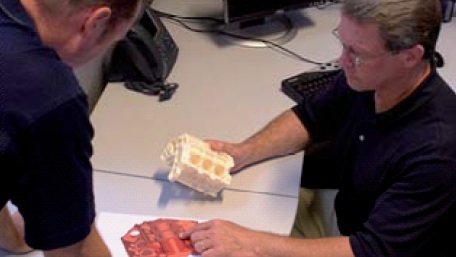 parts from 3D printers being evaluated be tested in the intended application prior to making a purchase decision. Stability of parts over time and across various use environments are not. Some materials may have rapidly deteriorating functional properties at temperatures slightly above the stated HDT while another material may have slow degradation of properties thus expanding the temperature range in which the plastic is useful. Another example is the eff ect of moisture on the part. Some 3D printed plastics are watertight while others are porous, allowing the part to absorb moisture potentially causing the part to swell and change dimensions. 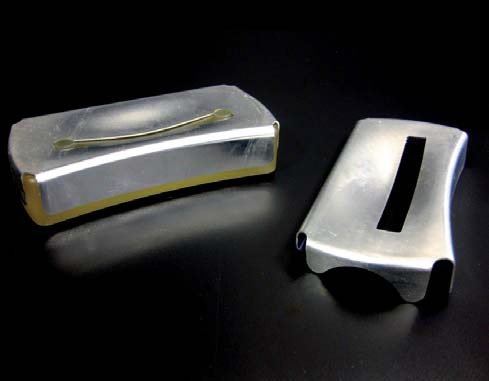 Porous parts are typically not suitable for high-moisture applications or pressurized applications and may require further labor-intensive post processing to be useable under those conditions. usability of in-house 3D printers. These inhouse 3D printers off er an expanded range of plastic materials that truly off er the functional performance of ABS, polypropylene and polycarbonate plastics in a single 3D printer. They offer easy, fast and aff ordable material changeovers allowing one 3D printer to provide a wide range of addressable plastic applications. When looking at technologies that claim numerous materials, pay particular attention to material waste that is generated during material changeover. Some of these 3D printers have multiple print heads that must be fully purged, thus wasting expensive print materials in the process. incredibly life-like models. In addition to putting life-like colors in all the right places, ZPrinters can apply photos, graphics, logos, textures, text labels, FEA results and more, and can produce models that are diffi cult to distinguish from the real product. Learn more about 3D Systems at www.3dsystems.com. higher vertical build speeds and little or no speed loss due to part geometry or number of parts in the print job are ideal for concept modeling because they enable the rapid production of numerous alternative parts in the shortest time period. additional parts are added to a print job or when the complexity and/or size of the geometries being printed increase. The resulting degraded build speed can slow down the decision making process and defeat the purpose of having anin-house 3D printer for concept modeling. While higher print speed is always considered benefi cial, it is especially critical for concept modeling applications. 3D printers that have high vertical build speed independent from part quantity and complexity are typically preferred for concept modeling applications because they can print a larger number of alternative models quickly for side-by-side comparisons to accelerate and improve the early decision making process. 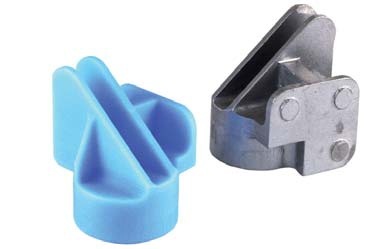 sparse support structures that are easily removed using less material to produce the supports than other plastic part technologies. Most single material 3D printers do not generate signifi cant in-process waste making them extremely material effi cient and cost eff ective. Other plastic technologies may use a separate, less expensive support material that is removed after printing by either melting, dissolving or blasting with pressurize water. 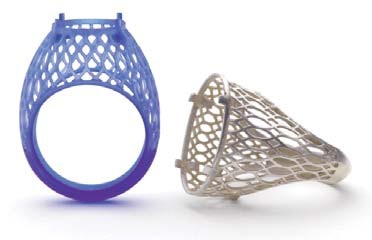 These technologies typically use greater amounts of material to print the supports. Dissolvable supports may require the use of strong, caustic chemicals that mandate special handling and disposal precautions. Waterblasting methods require a water source and drain that can add thousands to your site preparation cost. This method is labor intensive and can result in damage to fi ne part features as force is applied to remove supports. Also, supports located in hard to access cavities may be stranded and impossible to blast away. The fastest and most effi cient support removal is available with 3D printers using melt-away wax support material. 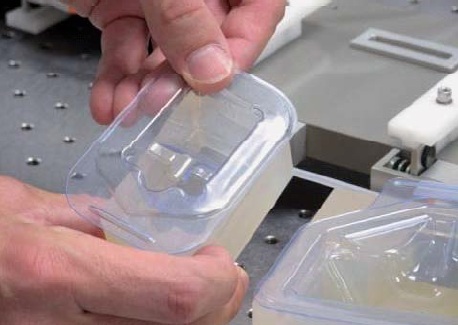 Melt-away supports can be quickly removed in batches using a specialized fi nishing oven with minimal labor and no surface force that can damage fragile fi ne features. Also, supports can be removed from otherwise inaccessible internal cavities providing the widest fl exibility to successfully print complex geometries. Removal of the wax supports does not require the use of chemicals and the support wax can be disposed with ordinary trash eliminating the need for special handling. expensive build material into the support material during the printing process to create the supports thereby increasing the total cost of materials consumed during the print. These printers also typically generate greater amounts of in-process material waste thereby using more total material by volume to print the same set of parts. 3D printers is resolution and should be used with caution. Resolution may be stated in dots per inch (DPI), Z-layer thickness, pixel size, beam spot size, and bead diameter just to name a few. While these measurements may be helpful in comparing resolution within a single 3D printer type, they are typically not good comparison metrics across discernible from standard published specifi cations and may lead to limitations in actual usefulness if not fully considered and tested. castable or may need high temperature resistance to perform in application. End use parts will typically need to remain stable over longer time periods. staying within a similar investment budget. capabilities can produce life-like visual models that do not need additional painting or fi nishing. some provide higher temperature resistance. Clear plastic materials, biocompatible plastic materials, and castable plastic materials are also available. The performance of plastic parts produced on diff erent technologies varies widely and may not be apparent from published specifi cations. Some 3D printers produce parts that will continue to change properties and dimensions over time or in varying environmental conditions. For example, one commonly reported specifi cation used to indicate heat resistance of a plastic is Heat Distortion Temperature (HDT). While HDT is one indicator, it does not predict material usefulness in applications that exceed the HDT.